Kristen at We Be Reading has declared March Diana Wynne Jones month, and she’s inviting readers everywhere to join the read-alongs she’s hosting, to watch Howl's Moving Castle together on Twitter, and to celebrate in any other ways they choose to. She also invited her fellow bloggers to host giveaways of their own, and of course I jumped at the chance to push one of my absolute favourite books on people. The book I picked was out of print for a few years (horror of horrors!) but thankfully it was reissued last year, so now I can recommend it to people without having to add “but you might have trouble finding a copy” in a forlorn tone. Polly has two sets of memories. One is normal: school, home, friends. The other, stranger memories begin nine years ago, when she was ten and gate-crashed an odd funeral in the mansion near her grandmother’s house. Polly’s just beginning to recall the sometimes marvellous, sometimes frightening adventures she embarked on with Tom Lynn after that. And then she did something terrible, and everything changed. But what did she do? Why can’t she remember? Polly *must* uncover the secret, or her true love – and perhaps Polly herself – will be lost. This isn’t a terrible way to introduce a book with a notoriously complex plot, but it doesn’t really tell you why Fire and Hemlock fans are so passionate about it. Let me start by telling you a story: one day, many years ago, I saw Jenny say in a comment (at Geranium Cat’s blog, if I’m not mistaken) that she felt that Fire and Hemlock fans should all be part of a secret society, and that she immediately wanted to be friends with any that she met. This memory makes me smile because it was exactly this comment that made me click over to Jenny’s blog, decide that I was going to read it forever and ever, and immediately add it to my Google Reader favourites folder, where it’s been for the past five years. Experience has taught me that assuming you’ll automatically have things in common with people who like the same things as you can lead to disappointment, but to this day I can’t help but feel that way about Fire and Hemlock. The people who really love it all seem to share the same sort of sensibility: not only do they generally enjoy the same kinds of books I do, but they seem to like them for similar reasons as me. Which is why I’m always so excited when I meet another fan, or when I successfully push it on a friend and they end up loving it as much as I do. Fire and Hemlock is a sort of retelling of Tam Lin, which appeals to the folklore lover in me. It’s also, as readers of Reflections will know, the first book where Diana Wynne Jones felt comfortable having what she calls “a real female hero”, and I think the thought process behind that decision is visible in the text in lots of subtle ways. I love this novel for Diana Wynne Jones’ sharp and perceptive writing; for all the ways in which it reminds me of why I love reading so much; for what it has to say about growing up and memory and creativity and emotional ties of all kinds; and last but not least, for being such an extraordinary piece of storytelling. When I say that it has a complex plot, I don’t mean to imply it’s anything other than a gripping read; it’s just that it’s also a novel that rewards close reading and paying close attention to details and coming back to the story again and again (and of course that novels can and often do both). 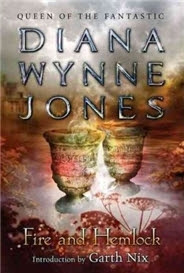 Jenny’s Law, which states that Diana Wynne Jones is always better on a reread, especially applies to Fire and Hemclock. The fact that I’ve never reviewed it here is a sign that my last reread was over five years ago, which makes me shake my head at myself in complete dismay. Anyway! The point of this post is to give one of you the chance to read this book (or to win a copy of your very own even if you’ve read it before). Because comments sections that go “Please enter me!” are kind of boring, I’ll make things more fun by asking you a question: Is there a book you love whose fans you think should belong to a secret society? Which books make you feel an immediate sense of kinship with people who love them too? To be entered, just leave your answer in the comments (though feel free to answer even if you don’t want to be entered, of course). The giveaway is open internationally and I’ll draw the winner in a week’s time. I've watched Studio Ghibli's Howl's Moving Castle but have yet to read any of her books although I've been meaning too! My favourite book in the world is The Secret History by Donna Tartt and I always feel I've met a kindred spirit whenever I find out someone loved that book, even if we never discuss it. For me it's really the ones no one has ever heard of. I don't know if I've ever met another fan of Janet Kagan's Hellspark, but just knowing that person is out there would mean a lot. There's a lot that's too complicated AND too simplistic about it, but that might be the first book that knocked me over with its ideas, and it has a place in my heart. Ever since I read REFLECTIONS, I've had FIRE AND HEMLOCK right at the top of my to-get list. I've always felt that "secret society" feeling when I talk to people and discover they loved LM Montgomery's books growing up. Same thing with A WRINKLE IN TIME. So I guess I feel that way about the books I read in my childhood which had a huge effect on my formative years. I feel that secret society bond with other fans of The Pursuit of Love by Nancy Mitford. Even though I've only met one in real life--but it was a warm, fuzzy feeling. My book would be The Gammage Cup, although I've never met any one else who loves it like I do. There are actually a couple other middle school books I feel that way about - The Egypt Game, The Westing Game. I feel that if someone has read and loved both of Deborah Harkness' books, especially A Discovery of Witches, there is an immediate bond. Even though the second book was more of a historical, it was so lovely, and if they loved that one, well, then I'm sure to have a reading twin! This is such an interesting question, and seeing as I hadn't read any DWJ until last month, I'll go with one from my formative years. Even though as an adult I recognize the issues with A Wrinkle in Time by Madeleine L'Engle, it was such a special book for me when I was young. It was so fantastically different, and I loved Mrs. Which and the others so much. The DWJ book I read was Howl's Moving Castle, and I thoroughly enjoyed it. I need to read more of her for sure. Thanks for having this giveaway, Ana! No need to enter me as I already own two copies of Fire and Hemlock (greedy me). I've always found that I get on well with readers who have loved The Eyre Affair. It implies they appreciate literature, adventure and a British sense of humor. I would definitely have to say my series for that would be the Kushiel series by Jacqueline Carey. Full on secret society stuff. I am a huge Diana Wynne Jones and have read & adored every book she has ever written ... except 'Fire & Hemlock'! So I'm desperately eager to win this giveaway. I know exactly what you mean by your 'secret society' and I have found similar keen friendships among lovers of writers like Joan Aiken, Elizabeth Goudge, Nicholas Stuart Grey, and Eleanor Farjeon. They have some magical quality about their books - a combination of silver-tongued writing, a clearsightedness into human nature,and a deep abiding wisdom that makes their readers long to be better people. I promise you that, if I win the giveaway, I will read it and blog about it just as fast as I can, so that I too can be part of DWJ month and hopefully help spread the word about her. I love Diana Wynne Jones but haven't gotten to read Fire & Hemlock yet! I've only read Howl's Moving Castle so I'd love to read more from her! Ah so many books I feel that way about but The special ones are - The Secret History and The Magus. Sadly I'm not sure I've read anything that would justify setting up a 'secret society'. I do think that I feel an instant kinship with individuals who have read and loved The Chronicles of Narnia though. No need to enter me—I've already got a copy of Fire and Hemlock! Sometimes I feel like just being a fan of DWJ in general (i.e. having read more than just Howl's Moving Castle) qualifies you as a member of a secret society! All her books have this subtle subversive edge, I think it draws out the kind of people I also like. If I had to name a specific book, however, I'd choose Anathem by Neal Stephenson. I say this because both I and my brother are fans, and we have our own little key words and phrases that make no sense unless you're familiar with that book. I have Fire and Hemlock and should re-read it! I think readers of Stephenson--not just Anathem--are a sort of club, and readers of Tolkien. The club I like is for people who have read The Gone-Away World. There's no other book like it. I feel like the fans of Meghan Whalen Turner's works (The Thief, A Conspiracy of Kings, etc) have practically formed their own secret society anyway. I mean, it's not super secret, although it's still on livejournal so not tons of people know about it, but they get together and chat, speculate, and do all sorts of wild things on a regular basis and it makes them the most active book fandom I've ever seen that's not one of the "big series" (Harry Potter, Hunger Games again et cetera). Well, I love John Green's books and I have recommended them to a lot of friends (most of them call me on the verge of tears... kidding! ), but there is already a kind of "secret 'not so secret' society" around those books, I don't know 100% of Nerdfighteria, but I love how a lot of different people have got to know each other, which, to me, is one of the most incredible things a book (or books and their author) can do. P.S. I've wanted to read 'Fire and Hemlock' for ages and haven't been able to get a copy, it would be grat to win it! I'm not entering, since I have two copies already--I just want to say that I agree about the Fire and Hemlock secret society! It's my very favorite book by my very favorite author. I love the idea of devoting March to Diana! Will do. :) And I've never read Fire and Hemlock - never come across it for some reason, in libraries, but after hearing that it's based-ish on Tam Lin I MUST read it! I sort of accidentally created a secret society with some friends in my 1st Senior year of college (I ended up being a 5th year senior with a double Biology/Psychology major). Shortly before the end of the Spring semester, a friend of mine, Georgia, called me and asked if I would like to go to town with her for the day. I said yes. Our last stop of the day was the bookstore. Being but a poor college student, I immediately hit up the bargain bin where I was entranced by the artwork on the hardcover edition of "An Unexpected Apprentice" by Jodi Lynn Nye. I started reading it a few days later and was about halfway through it when I had to go to my Organic Chemistry Lab. For the most part our professor would get us started and then go back to his office where we could find him if we had questions. I was just going to his office when I noticed a book on the science secretary's desk. My book, my copy of "An Unexpected Apprentice!" Except, it wasn't my copy, was it? I had removed the sale price sticker before I started reading, and I certainly never used a time card as a bookmark. So, it must be coincidence, or perhaps providence? I had seen Mrs. Elaine, the Natural Science's secretary before, asked her for some forms and some help with my degree plan, but I never really took the time to talk to her. We talked about the book a little when she came back to her desk, and I asked her what other sort of things she liked to read and we talked for a while until I remembered that I had a lab I was supposed to be doing. A few days later, I stopped by and talked with Mrs. Elaine again and asked her if she had ever heard of an author by the name of Diana Wynne Jones. She had not, and I told her that I had a book that she might like to borrow. I think the first one I let her read might have been Dogsbody or maybe the Power of Three, but I could be wrong. Then the spring semester ended. It was during the summer and I was practically the only person living on campus because I was conducting my summer biology research. There were a few others, but I hardly ever saw them, I kept irregular hours because my dorm room did not have A/C no matter how many times I asked housing to fix it. So, other than my biology research, which was self-paced, I had endless amounts of time to myself with high speed internet and a few of Diana Wynne Jones' books that I thought I might get around to rereading. Imagine my delight when I found out that Science Secretaries work all through the summer too and that they have air conditioned offices and plenty of time to discuss books. Through Mrs. Elaine, I quickly made friends with Dr. Hubbard with whom I had never had a class. Together, all three of us embarked on a quest to read or reread all of DWJ's works in the following year. I made up a spreadsheet with a checklist for all of the books, and Mrs. Elaine kept it under her blotter on her desk. We didn't quite make our goal, what with having to take classes (and teach them) but we had a lot of fun all the same, and we still like to swap books from time to time when we get together. Twice I have tried to understand the ending of this one, twice failed, but maybe third time would be the charm! Part of me wants to be all, I NEED A SECOND COPY OF THIS BOOK. But don't worry. I am repressing that part of me. I'm very fond of my own current copy. This book. Oh this book. Hmm, what a fascinating question! I would have to say Tamora Pierce, especially her Song of the Lioness books. I met one of my best friends because we were both reading Tamora Pierce and saw each others' books. There's just something about them...I tend to wind up in impassioned conversations with people about how Tamora Pierce changed our lives. Hmmm. Who do I want to be in a secret society with... Maybe people who love Tipping the velvet? Yeah, that could be pretty awesome. Or The night watch. But probably Sarah Waters and not Fingersmith, even though I love Fingersmith, because that's a different kind of appeal, I think, I don't know. Or or or, Ibsen lovers. I would totally join a secret society of Ibsen lovers and discuss Hedda and Gina and Nora and Solveig all day. Yep. Or people who actually like Une Vie. I know people don't have to have much in common with me just because they happen to like the same book as me, but if you love Une Vie and don't think it's boring and depressing and pessimistic (it is not! how very dare you?) then I can't imagine that I don't want to be your friend. Yeah, basically I want all books to have their own secret societies so that I can join a dozen or so. That would be wonderful. I have two authors who have this effect on me; Mervyn Peake and Antonia Forest. They're very different; Peake is weird, verbose fantasy and Forest is best known (whatever that means when she's obscure and out of print) for her school stories, but I have formed friendships based entirely on the other person liking either of these two authors, and it's never failed to work as a marker of My Sort Of Person. Anathem is an interesting choice and I loved it but my Secret Society Bible would probably be The Glass Books of the Dream Eaters. Has ANYONE else actually read it? I'm planning a re-read this year and I will hopefully read the other two books in the trilogy. - and now Dianna Wynne Jones books, since I was fortunate enough to discover them. And for good measure: anyone who hates the Twilight and 50 Shades books is also a kindred spirit! Oh, I think I will have to second MWTs the thief series. I'm glad u enjoyed your foray into them recently! I felt that way about "The Mysteries of Glass" by Sue Gee. For days I was completely immersed in the quiet atmosphere of her writing, then someone saw me reading it on the train and told me she loved it. At first I was self-conscious, being caught reading and all that, but actually it was nice being able to gush about the wonderful writing to another fan. Diana Wynne Jones is on my list of authors I discovered following your blog, a special month is an excellent occasion to finally start reading her books. What a great question, Ana! It's the perfect question because I am reading the comments and noting every single book mentioned for future reading. I want a secret society for readers of Eloise Jarvis McGraw's Greensleeves, which, alas, has been out of print for years, but is utterly delightful. I am quite certain that I would be charmed by any reader who was charmed by Greensleeves. And then I saw Kate Forsyth's comment re: Elizabeth Goudge and I have to agree that hers would be an excellent secret society for me as well. But do not enter me in the giveaway! Jenny browbeat me into reading Fire and Hemlock years ago (Thanks, Jenny! ), so I already have a copy. As a winner of your previous giveaway of this title, I cannot thank you enough for introducing me. I am so happy to see you are sharing the love again! (And I shall be stalking the person who wins to see what they think, well, in a friendly way). I've only read Diana Wynne Jones' series (Howl and Dalemark and Chrestomanci) and am inspired to read more because of DWJ March at We Be Reading. Your review of "Fire and Hemlock" has intrigued me to put it on top of the list! I feel an immediate kinship with people who love "The Lord of the Rings". I think we're all part of a society already. :) Same goes for people who read Stephen King, especially those who also love "The Stand". Thank you so much for your answers, everyone! I had a ton of fun reading them, and I love that some of you shared your stories even though you weren't entering the giveaway.